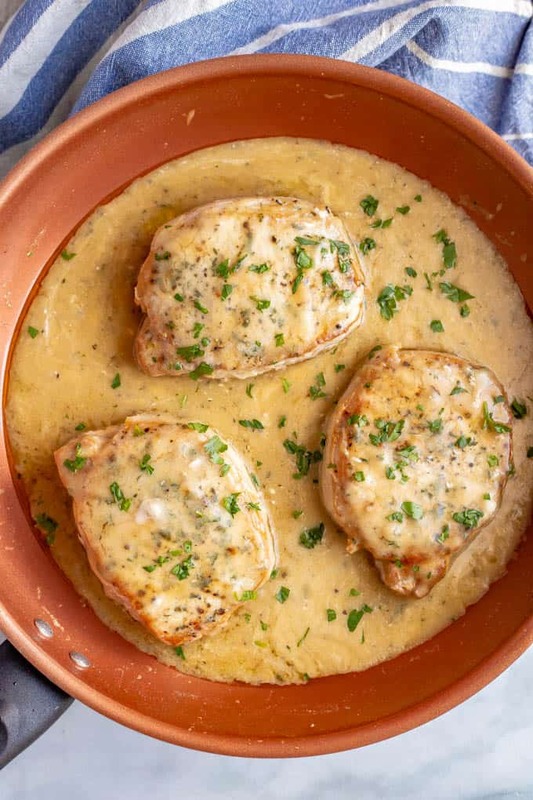 Easy skillet pork chops with gravy are tender, creamy and seriously comforting! 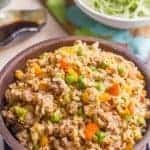 This easy one-pan recipe requires just a few simple ingredients and is ready in only 25 minutes! This post is sponsored by Farberware. As always, all thoughts and opinions are my own. Whatever the reason, I’m going to move us right along today to the FOOD! Cause I’ve got a crazy good pork recipe to share with you today that I know you are going to love! 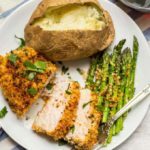 So, my spice-rubbed pork chops are a go-to in our house – so easy and such simple ingredients – and we all love my garlic butter pork chops with lemon too. Today I’m excited to finally share with you my easy skillet pork chops with gravy. 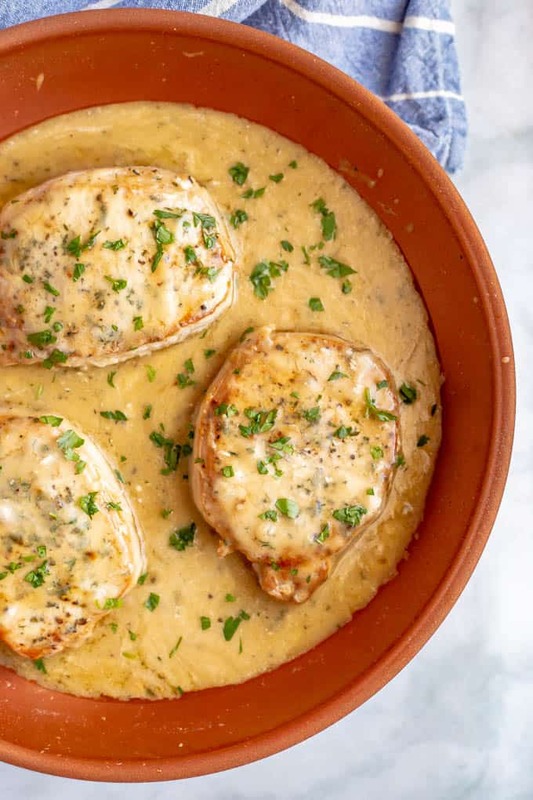 It’s a one-pan recipe that’s ready in just 25 minutes and has the most tender pork chops and the most incredible smooth, rich, creamy gravy to go on top. It’s perfect for a warm and comforting dinner that’ll have everyone at the table digging right in! 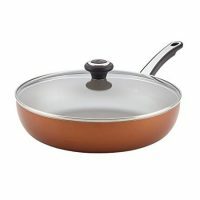 I’m also excited today to feature my new favorite pans, these copper Farberware Cook pans that I got last month. I am LOVING these pans! They are beautiful, for starters, but oh wow, that nonstick surface is amazing! I feel like the food is suspended in the pan almost, everything slides around so easily. No sticking at all! And what I’ve also realized is that I can get away with a lot less oil/butter because the food just doesn’t stick. So it’s gonna be great to lighten things up in the new year! 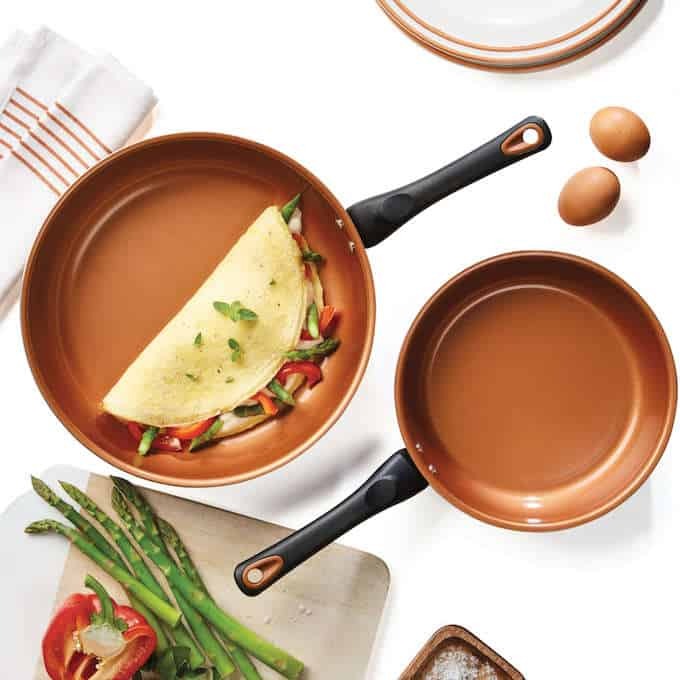 And bonus, I’m doing a GIVEAWAY of the skillet twin pack so you can have two gorgeous new pans in your kitchen too! Head on over to THIS Instagram post to enter to win. Good luck! 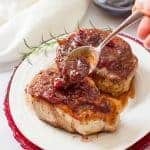 These easy pork chops with gravy are comfort food to the max but still on the healthy side, so it’s totally do-able even if you’re trying to slim down this month. The pork chops are seared in a skillet until golden brown and then set aside to rest for a minute while you put together the gravy. 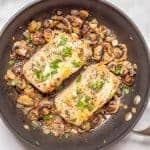 They they get nestled back in to finish cooking in the gravy, making this a really easy one-skillet dinner! 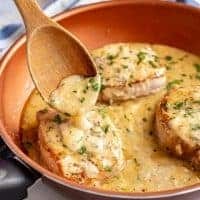 This is a really simple, basic gravy for pork chops but it’s so creamy and delicious! You’re going to want to eat it with a spoon. Which you totally should. But save enough to drench the pork chops. And maybe some extra to drizzle over everything else on your plate. The key to a yummy pork chop recipe is not overcooking the pork. I’ve included some tips below on how to get tender pork chops every time. I use white wheat flour, because that’s what we always have on hand, but you can use all-purpose flour here. It’s just the thickening agent for the gravy so it doesn’t matter too much. If you don’t have any fresh thyme, you could use dried thyme or substitute some Italian seasoning, basil or oregano. I use non-fat Greek yogurt for the creamy element in this recipe, but sour cream works too. Ready to complete the meal? 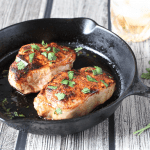 – How long your pork chops cook will depend on their thickness and your exact heat level. – I highly recommend using a meat thermometer to check the temperature. I have a digital one made by Weber that I love. – Let the pork chops rest for 3-5 minutes before you slice them, so that they retain all their juices and don’t dry out. It’s really easy to overcook pork chops and then they just taste bland and tough. I really do use a thermometer whenever I make them to avoid this. But also, having a yummy gravy like this to drench every bite can cover up any accidental overcooking. Gotta love a forgiving recipe! 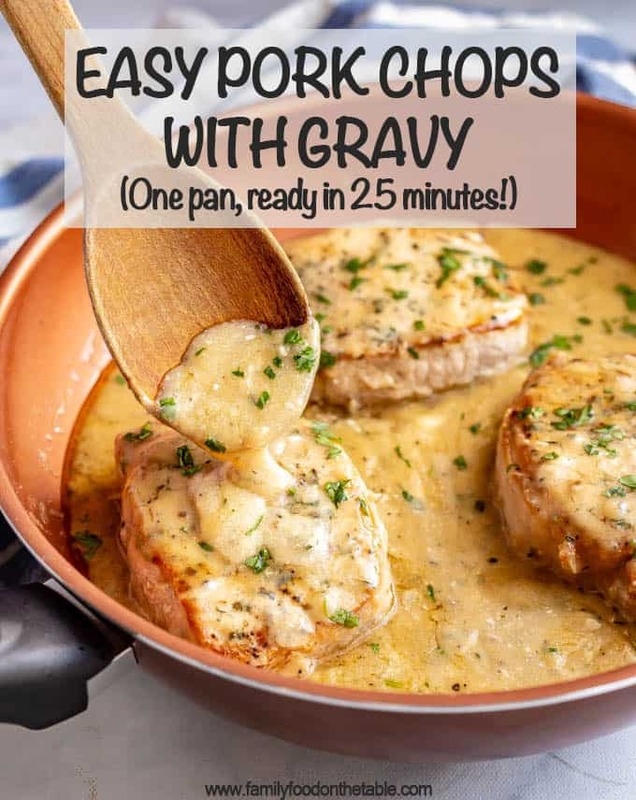 I hope you give these easy pork chops with gravy a try! P.S. 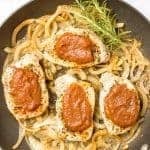 You can also check out this recipe on the Farberware site, while you go ogle over their beautiful pans! And don’t forget to enter the giveaway! 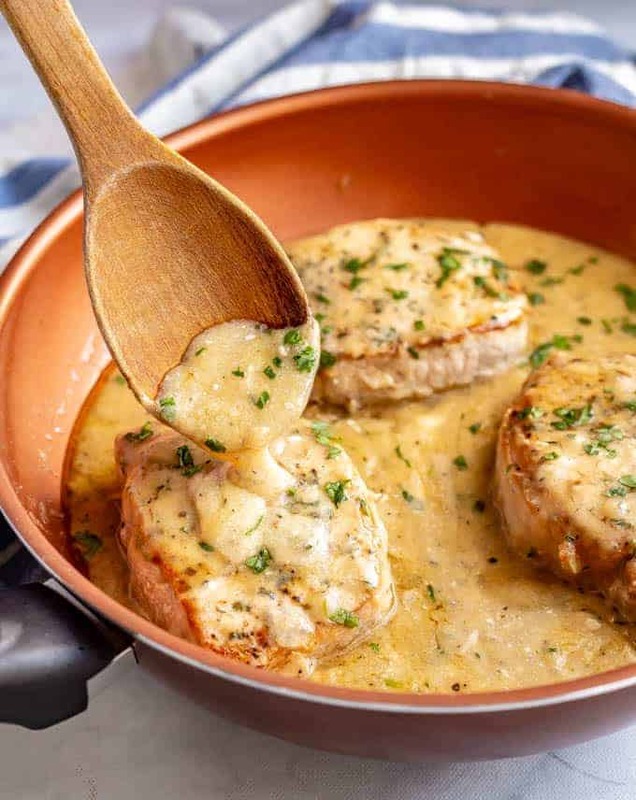 Easy skillet pork chops with gravy are tender, creamy and seriously comforting! 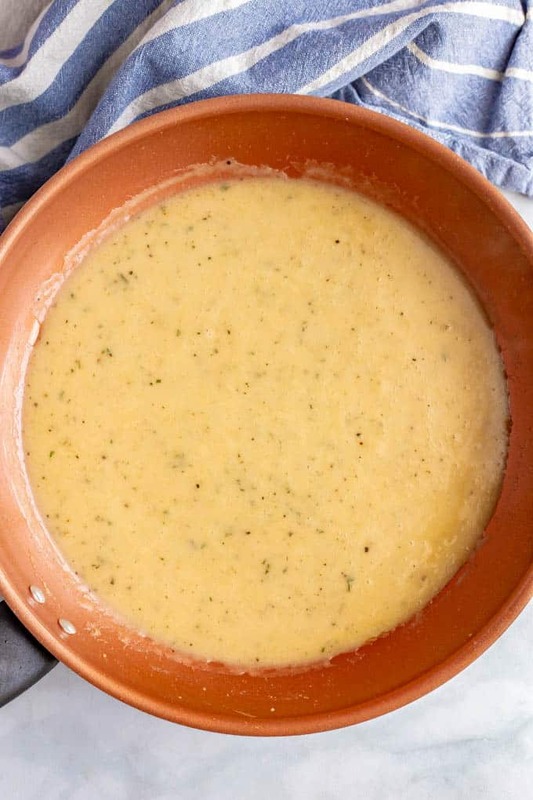 This one-pan recipe requires just a few simple ingredients and is ready in only 25 minutes! Season pork chops on both sides with salt, pepper and thyme. Heat a large skillet over medium high heat and add the olive oil. Make the gravy. Reduce the heat to medium low and add the butter to the skillet. Add the flour and whisk to combine. Cook the flour mixture for 1 minute, whisking occasionally, to get the raw taste out. Add chicken broth to the pan slowly and whisk continuously to combine until the mixture is smooth, without any lumps. Sprinkle in the thyme, salt and pepper. Let the gravy cook over medium-low heat for 3-4 minutes until slightly thickened. Return the pork chops to the pan and turn to coat them in the gravy. Cover the pan with a lid (or aluminum foil) and cook for 8-10 minutes, until pork chops reach an internal temperature of 145. Remove from heat. Add the Greek yogurt to the gravy and stir to combine. 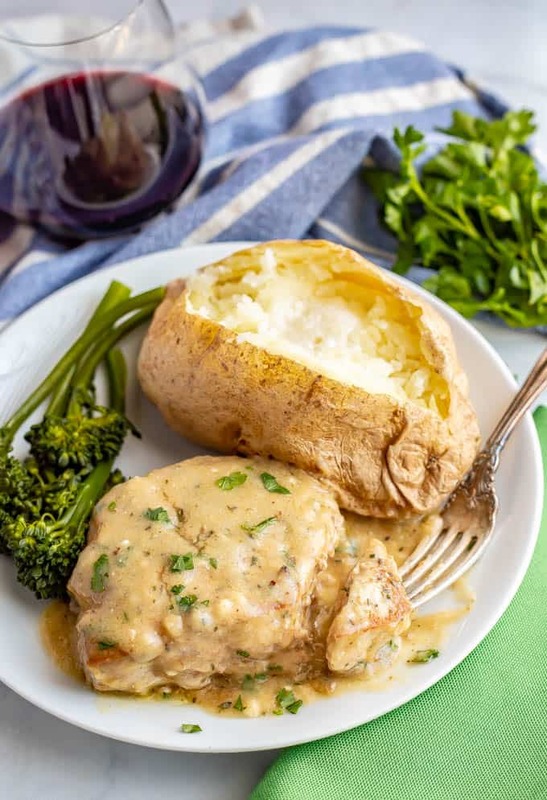 Serve the pork chops with plenty of gravy over top. I use white wheat flour, because that’s what we always have on hand, but you can use all-purpose flour here. It’s just the thickening agent for the gravy so it doesn’t matter too much which kind of flour you choose. 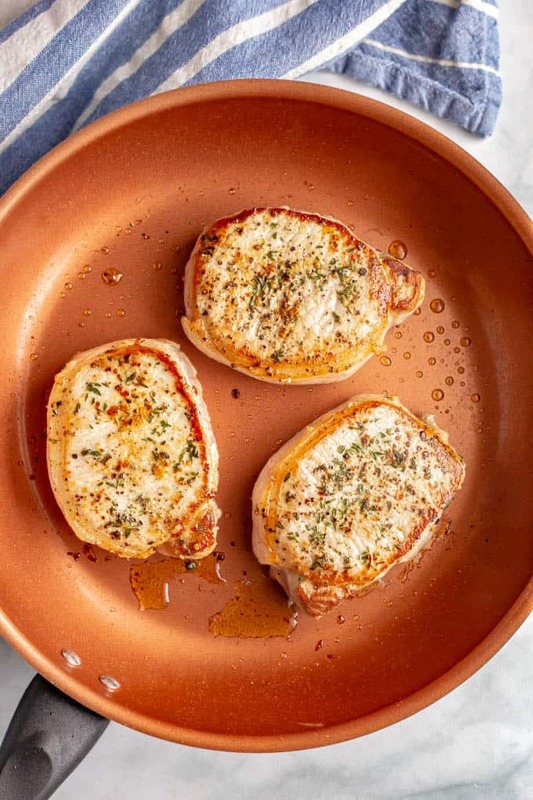 These porks chops look really tender and delicious! And since I’m all about sauce that gravy takes it too a whole ‘natha level! That gravy definitely takes it up a few notches! It’s so creamy and yummy! Love pork chops and gravy! Such a good comfort meal! Add some potatoes and it’s perrrrfect! Such a classic, comforting combo, right? !